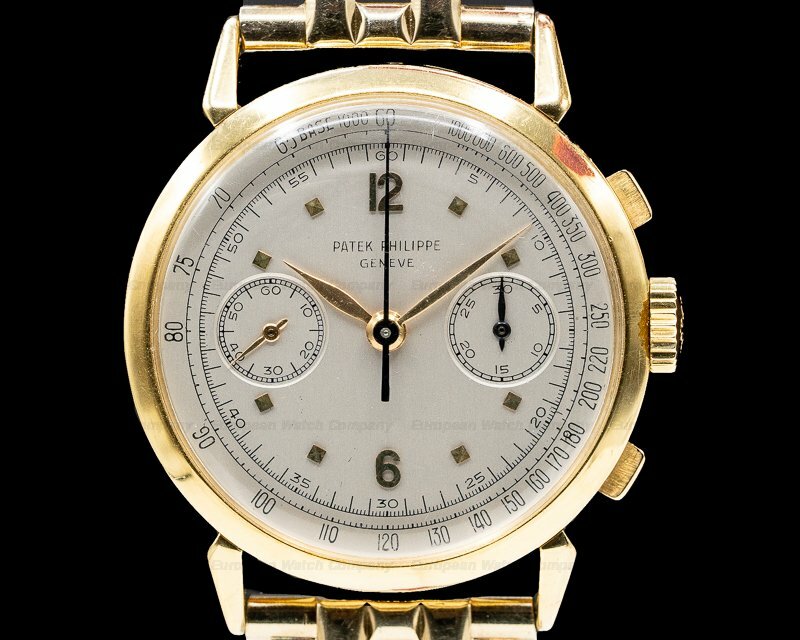 30664 Patek Philippe 3970EJ Perpetual Calendar Chronograph, 3970J, second series with leaf hands and squared markers, this early series was only introduced with a solid back and no display back, this series was always fitted with a tang buckle, yellow gold case on a strap with a yellow gold tang buckle, hallmarks on the back case are thick and defined, chronograph, perpetual calendar (day, date, month, leap year, moon phases), manual wind, 24-hour indicator, sapphire crystal, water resistant to 25 meters, the caseback hallmarks are deep and bold, size: 36mm, thickness: 12.9mm. Like New with original box, papers, archive certificate, and original Patek certificate dated March of 1988. 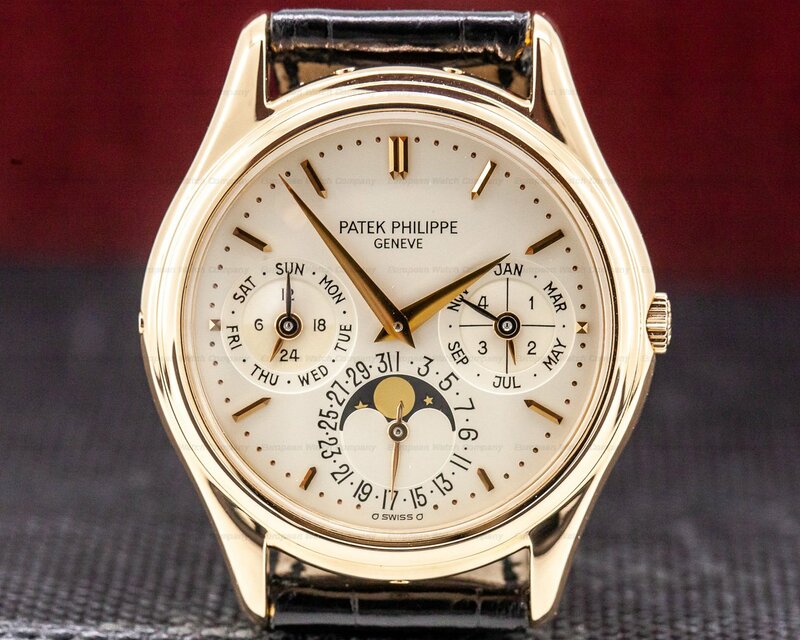 This is an 18K yellow gold Patek Philippe Perpetual Calendar Chronograph 3970EJ. 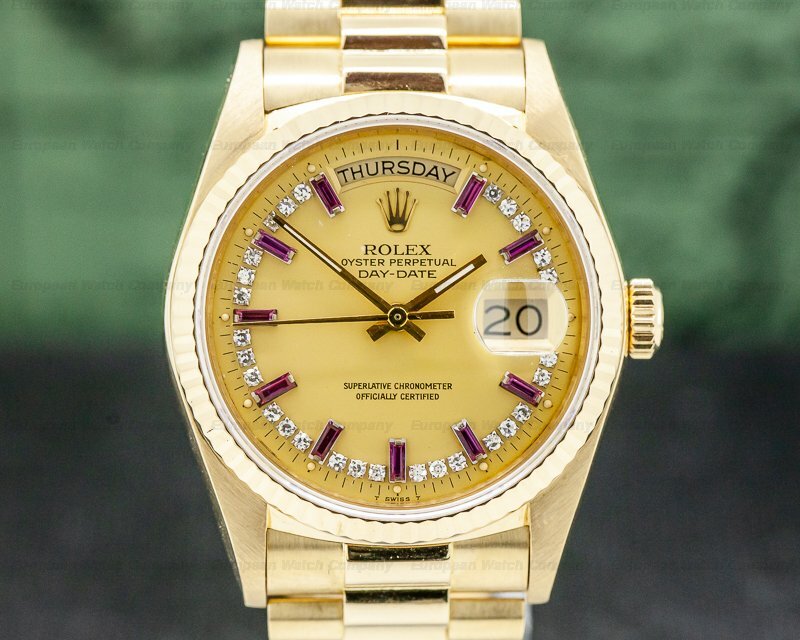 It has a leather strap with a matching 18K yellow gold tang buckle, and a scratch resistant sapphire crystal The 36mm diameter solid three-body case, downturned lugs, and rounded stepped bezel are polished. There is a screwed-down solid case back with a setting pin. 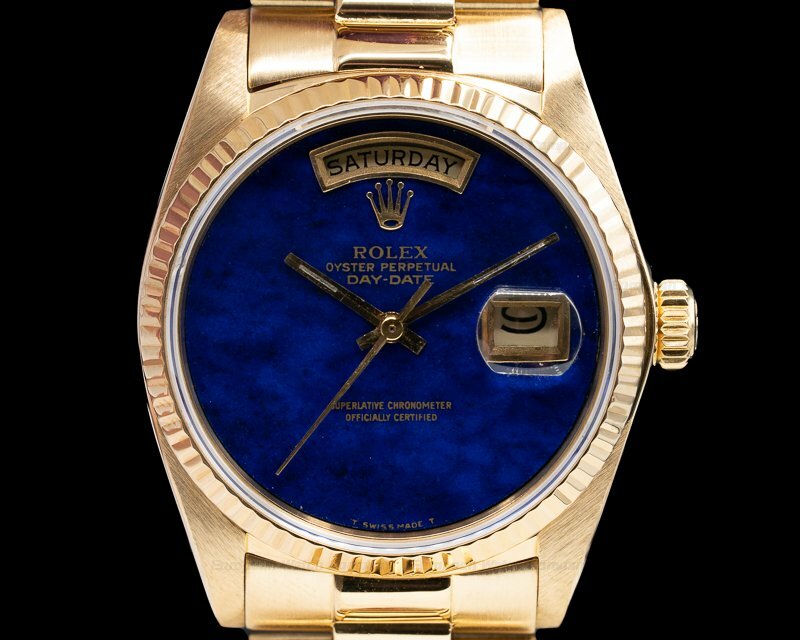 It has a satiné silver dial with applied yellow gold faceted baton hour indexes and feuille hands. 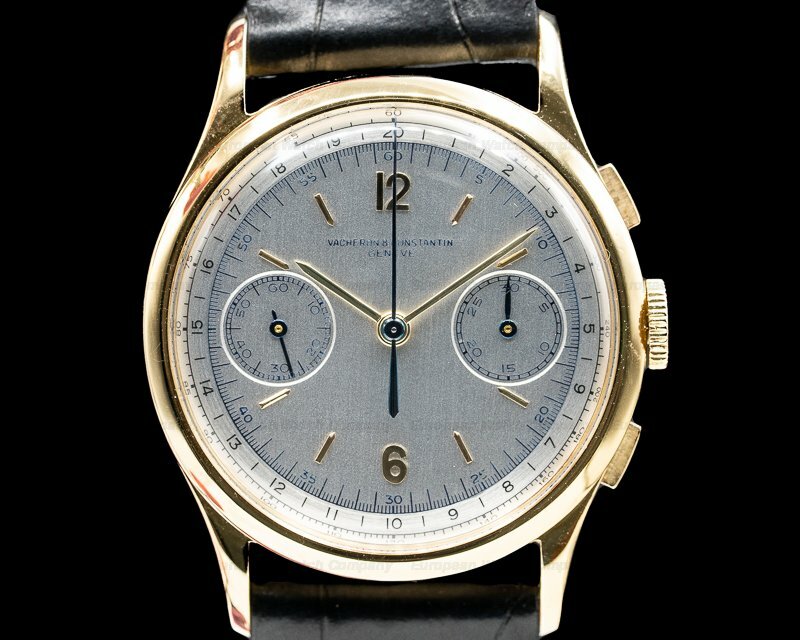 A grand complication watch, it has a round-button chronograph and perpetual calendar with subsidiary dials for the seconds and for 24 hours at 9 o'clock, the 30-minute register at 3 o'clock, and the moon phase and days of the month at 6. The day of the week and the month are indicated in twin window apertures at 12. 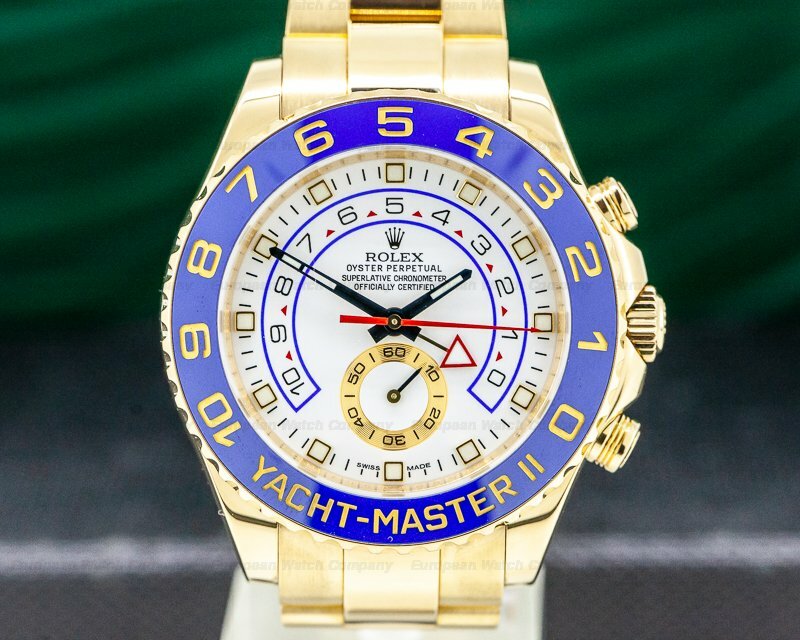 It's water resistant to 25 meters/90 feet, and the 12.9mm thick case, dial, and movement are all signed. The manual winding caliber CH 27-70 Q movement is rhodium-plated with fausses cotes embellishment, and the stamp of the Seal of Geneva quality mark. 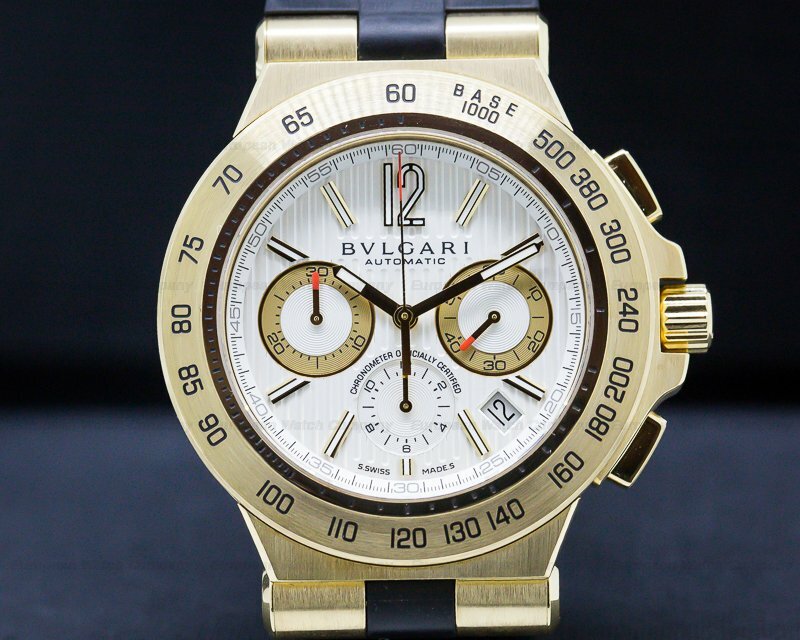 It's constructed with 24 jewels, a shock absorber mechanism, and a straight-line lever escapement. It includes a self-compensating Breguet balance spring, and the patented Patek Philippe Gyromax balance that compensates for cold, heat, isochronism, and 8 positions. The case, dial, and movement are all signed. 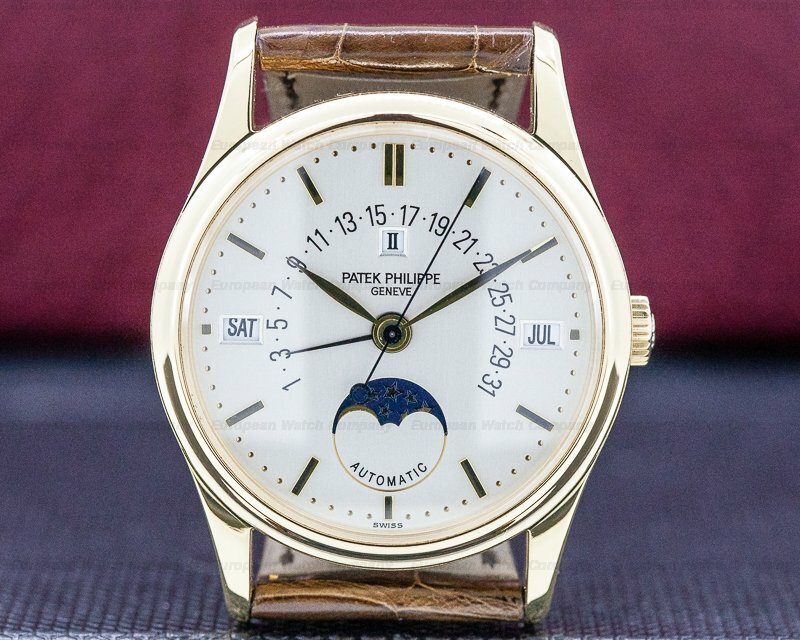 In 1925 Patek Philippe brought out the first perpetual calendar wristwatch that automatically adjusted itself for the months with only 30 or 28 days, as well as for leap years. This was a grand complication that was a rare specialty. 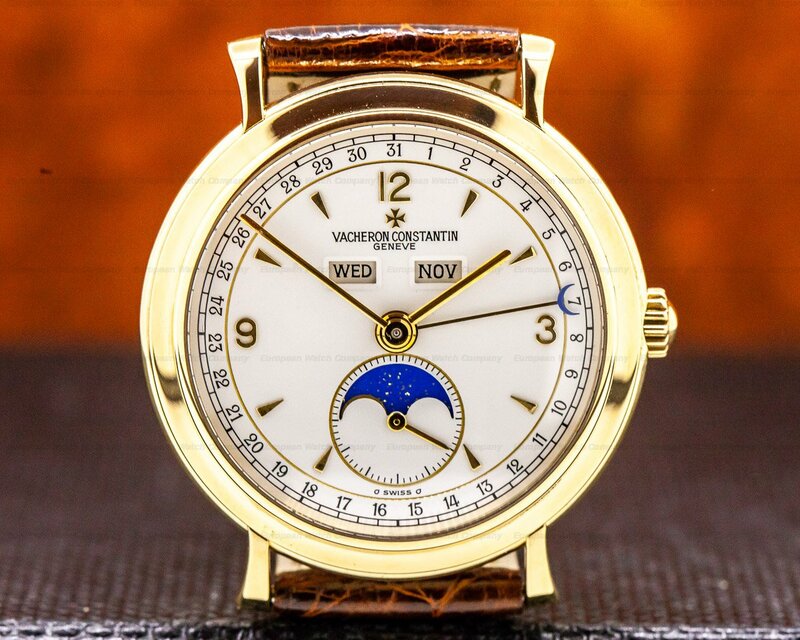 In 1941, at the beginning of World War II, Patek started regular manufacture of the perpetual calendar watches, a staple that helped the company to survive the war. 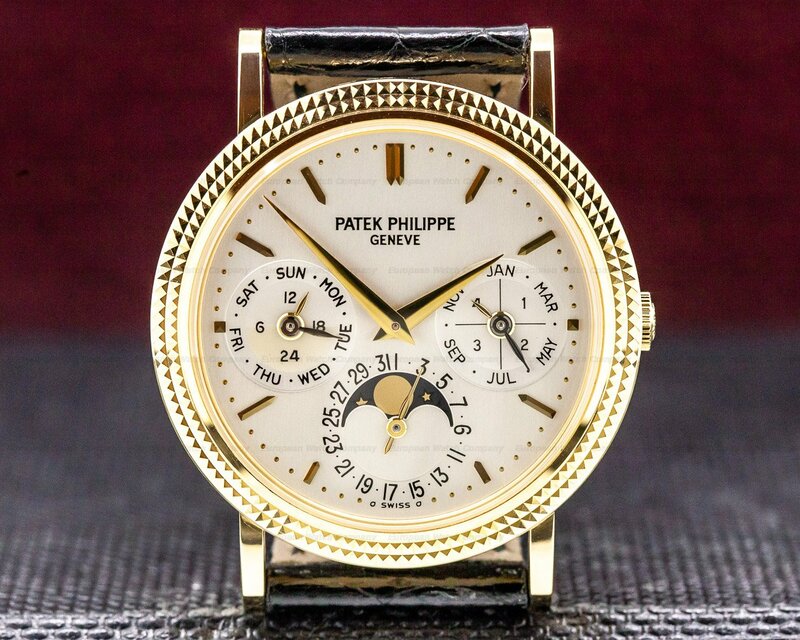 Patek Philippe 3941 R Perpetual Calendar 18K Rose Gold Display Back VERY RARE!